Swayambhunath, also known as the monkey temple. Everything closes early in Kathmandu. 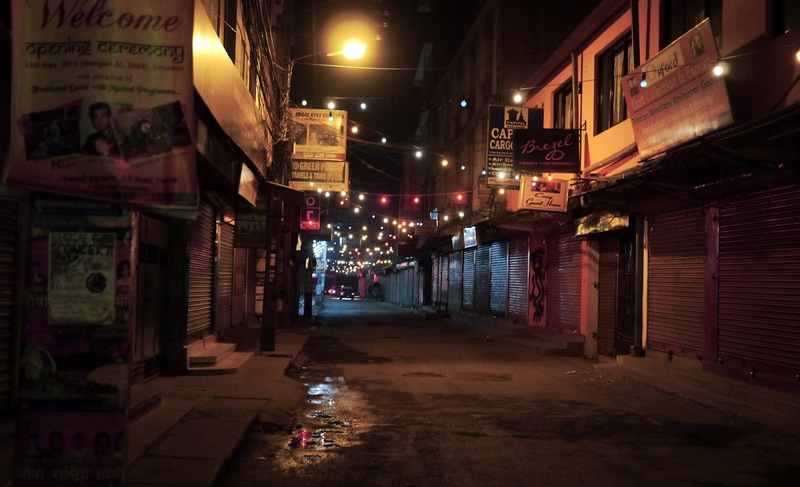 Most bars and restaurants close around 11pm, even in Thamel, the tourist hotspot. Over the past couple of weeks, we've walked all around Kathmandu. We walked out to the Eye Hospital for Bree to get a check up. it was about an hour walk to the East of the city, close to the airport. On the way there, in the chaos of a bus stop that also had dozens of vendors, there was a frightening moment where Bree and I lost sight of each other. Bree thought I was behind her, so she went back looking for me. 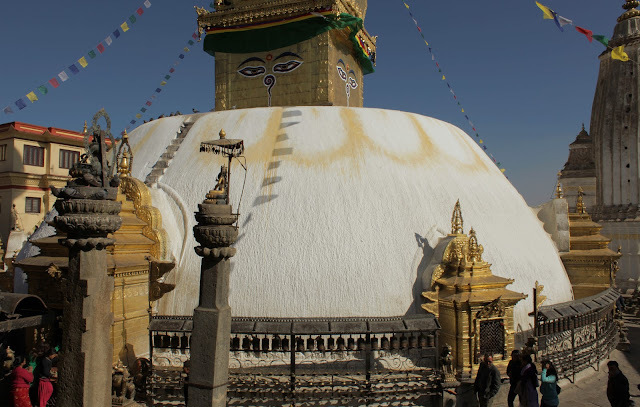 I looked back and only saw a sea of Nepalis boarding or disembarking the minibuses. We found each other within 10 minutes, but all the same our hearts were pounding and our minds were going to dark places. We agreed to keep each other in sight from now on. 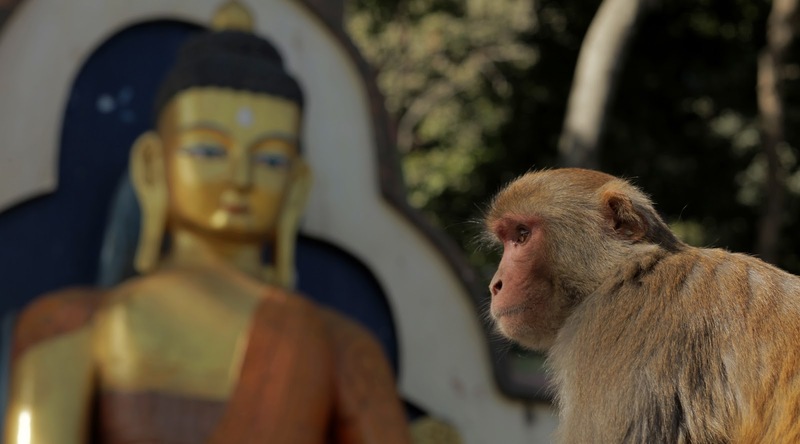 On another day, we walked up to Swayambhunath, a Buddhist temple on a hill west of Kathmandu, where several hundred monkeys dwell. The temple and the monkeys provided a good show. There seemed to be some in fighting among the males which led to a lot of howling and arguing. The unfortunate thing about the temple are all the touts and panhandlers. One young man claimed to be a student monk who wanted to practice his English with us. We've heard that line enough now to know it's a red flag. Plus, his leather jacket didn't quite seem right for a monk in training. But all in all, you try not to let any of it bother you too much. We've been to Durbar Square twice, enjoying the sunset from a rooftop cafe and we stopped in Snowman Cafe, a coffeeshop/bakery that has been in operation for over 40 years. 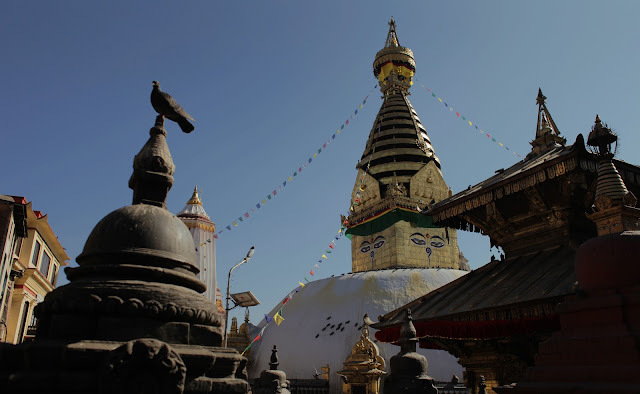 Bree's Dad came through Kathmandu in the early 70's and told us that he had been there. It doesn't seem like the place has changed much at all, except that they may have swapped the collection of eight tracks for cassette tapes on display. The trekking season is over in Nepal and we've noticed the number of Northface-clad white people dwindling since we arrived. The other group of white people, the volunteers are still around, but they tend to wear flowy baggie attire that they don't look comfortable in at all.